Don’t know much about fly-fishing, myself, though I know many who do and revel in its necessary quietude and Zen-like keen focus. Oh, and c’mon, can there be a better-named place than Last Chance, Idaho, to do it in? I like a man who fly-fishes and paints landscapes. Don’t paint at all myself, but I know many who do and this man paints delicately and evocatively and shares his spirit through his brushstrokes. I like a man who fly-fishes, paints landscapes and plays cribbage. My own grandfather taught me the game and we played every night after dinner. Author/artist Dave Hall plays along the riverbank with a friend when the weather turns nasty . . .
and drank rum until the weather passed. I like a man who writes a book about fly-fishing and cribbage and grandfathers and friendship and allows his words to be printed right over his excellent and evocative landscapes. Because that decision indicates one is self-effacing but assured: those paintings are worth pondering. to do what I do. And they’ve encouraged me in ways mysterious. I like a book about fly-fishing and cribbage and friendship and family printed over paintings worth pondering where the consistently positive reviews on the back cover by people I admire like Jeff Metcalf and Melanie Rae Thon and Thomas McGuane may contain more words overall than does the book itself. When the paragraphs are succinct but well thought out and worth lingering over they are a pleasure to sit with. chance (small) you’ll get eaten. 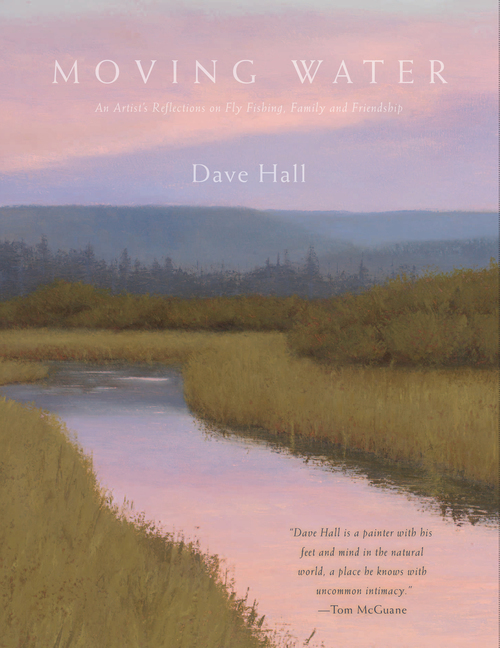 I like a book that has binders beneath the dust jacket that are a rich gray and will look fine on your family’s shelf long after the jacket has crumbled into dust and so have you and you are remembered as the relative with exquisite taste who could appreciate Dave Hall’s Moving Water back in the day enough to treasure it even though you didn’t know much about fly fishing yourself.